One of the larger rivers flowing into Lake Taupo, the Tongariro River to the south is very popular with anglers in search of trout. Anyone can have a go, so long as you have the right fishing licence but if walking or cycling is more your family’s thing, then there’s a great flat-ish track giving the option of a decent loop walk or bike ride. While you won’t always have a view of the river along this track, it’s never far away and there are river access points along the way. Although it’s worth noting that many of these are for anglers and not for small children to go wondering down unaccompanied – don’t let littlies go out of sight ahead of you. The whole loop between 2 bridges is 15km and would take an experienced cyclist about an hour to complete. Walking it all could be as long as 3 hours – more if done at snail’s pace! You could also just walk part of the track and return the same way. Much of the track is through bush and pleasant if you’re trying to escape the sun. It’s shingle and should be fine for sturdy buggies. After heavy rain it would be wet in places and gumboots for walkers that don’t want to walk around puddles, would be a good idea. The bush and places where the track veers inland, mean that river views are definitely limited but to make the most of the river, use the access points at both/either bridge – you can go down and skim stones, have a picnic or even paddle, although you’ll need to keep a close eye on the kids as it is a very fast flowing river. If you’re looking for food or a drink before or after your exercise, the Creek Tackle House Cafe is just near the northern most bridge. 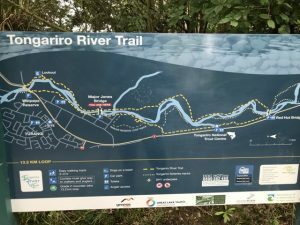 Address: there are lots of points to access the trail but the main place is at the corner of Koura and Tahawai Streets where there’s a car park, a little ‘beach’ area, grassy reserve and map of the trail.